LDP Bottle Chemical Filling Machinery is newly-designed machine model by our company, which is more advanced than other common anti-corrosive filling machine. LDP bottle chemical filling machine indeed can reach goal that the 100% no leaking. 1.1 Suitable material: Bleach, acid liquid, 84 disinfectant, gel water,toilet cleaner, especially used in the liquid filling of strongly corrosion liquid and cosmetics which can’t touch the metal. 1.2 Contact liquid parts are use anticorrosive non-metallic material and with diving function. 1.3 This Vertical filler is a high-tech filling equipment integrating on the PLC microcomputer programmable control, and photo electricity transduction pneumatic action. 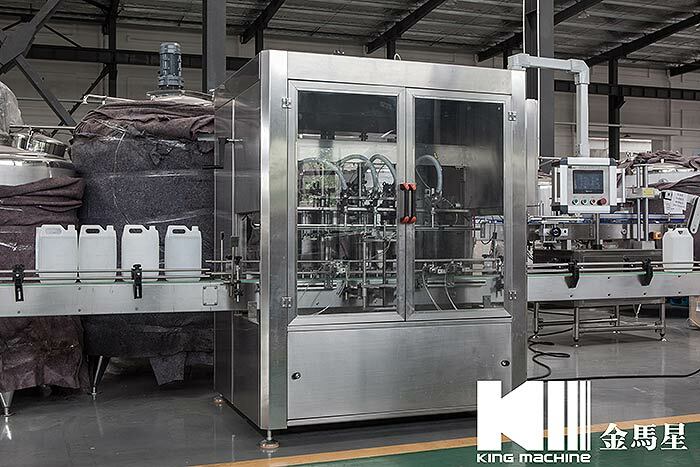 1.4 The LDP bottle chemical filling machinery suits for the filling of different sizes of vessel may change the filling sizes within a few minutes. Short filling circle, high production capacity. 1.5 User may choose the filling volume and decide the filling heads per own production capacity. 1.6 The precision time of the pneumatic valve filling may set to 0.01 second, can make the measurement precision control within ±1%, to decrease unnecessary material loss and enhance the economic efficiency. 1.7 Each filling-head’s measurement may be individually adjusted torealize the same filling measurement. 1.8 The LDP bottle chemical filling machine set such function: having counting program of bottle-feeding, doesn’t fill as there is not bottle or the counting doesn’t attain a predetermined position, can start filling only when the counter records that the bottle number is same as the setting filling number. 1.9 More or less of the filling volume, may initially adjust to the needed Filling volume, then micro adjust, can get the ideal filling measurement precision.